This was one of the first historical facts I was taught, and it served as a beginning point of my indoctrination into the myths of America. I was shown pictures of a courageous, over-achiever, who spurned conventional wisdom, and for the love of God and country sailed west to go east and coincidentally discovered America. However, over the years I have learned truth that contradicts these myths. Perhaps it is time to reconsider how we commemorate the 12th of October, 1492. These myths are part of the American Civil Religion which claims the wealth of the United States is proof that the Divine approved of the oppression and near genocide of the Original People of this land, the enslavement of Africans who were forced to extract riches from the soil. This theology also excuses the exploitation of poor Europeans, and Asians who came to this land (in pursuit of a better life) because, for this divine power, the means are justified by the ends. Hear me well, there are many things I love about the USA, there are many examples of good things the USA has done in the world. However to deny the evil and unjust events of our history, which played a significant part in the growth of power and wealth of this land, and ONLY focus on the good is unhealthy and delusional. It is akin to the abused woman who refuses to see that the man she “loves” has some real problems and needs help. Clearly, the “name we claim” does not seem to matter to God, if our actions are inconsistent with his will. I will not try, in this space, to expose the brutality of Columbus. His blind greed, willingness to kill, maim, and lie to get what he wanted, Gold and Glory, are well documented . I will direct you to “History is a Weapon” by Howard Zinn and a short visual presentation from THE OALMEAL. True, Europeans would have come to the Americas; if not Columbus it would have been another. However he laid the foundation and set the standards for future European exploration and contact with the Native People. 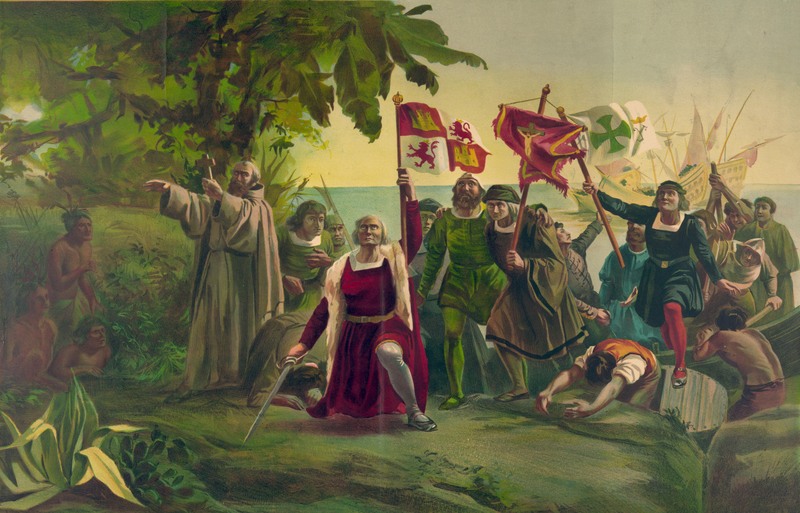 Columbus, his patrons, and his crew defined the purpose for which the Explorers came and how they would interact with the people they encountered. Considering the horrific chain of events that Columbus put into place, perhaps as a nation we should reconsider how we remember October 12. Columbus Day only became a Federal Holiday in 1937, and so there is no ancient American tradition we must protect. Since it began relatively late in our nation’s history, is there a reason it cannot be revisited and redefined as we consider how to best promote the social and relational health of all our people? In spite of all the good things we enjoy in our land, the growing economic and educational disparities are a matter of grave concern, fostering distrust between people of various economic, racial, and ethnic groups. The present inequities and distrust are rooted in practices and policies that began with Columbus and the colonization of the Americas; the near genocide of Native Americans and the enslavement of African people. Without an acknowledgement of these historical foundations of injustice we cannot not move towards a society where economic and social equity and justice are normative. Other countries, specifically South Africa, have made strides to transcend historical injustices by implementing processes for social healing through remembrance (truth-telling) and active repentance (actions to repair the damage done by the past injustices and continued disparities). What if Columbus Day was replaced with a day that encouraged us to tell the truth about the past, and then to go do something to make the future better? There is some movement to end the observance of Columbus Day. From Chile, to Venezuela, to Canada, Native People have advocated for “Day of Indigenous People / Resistance,” even South Dakota has officially ended Columbus Day for “Native American Day.” I applaud these efforts, which raise awareness about the real legacy of Columbus. Creating space in the broader society, where all can celebrate and honor Native People, their history and culture is a significant way to overcome stereotypes and grow beyond the past. But a celebration to honor Native Americans need not be tied to the day their cultures began to face extinction, but to remember people, places, and events of their choosing. However, Columbus’ story is part of my story; the story of those who are of European ancestry. He is the abusive grandfather in the family who laid patterns for generations of dysfunction. For this reason, if we are to move beyond the cycles of the past, we must acknowledge reality the past. An end to Columbus Day could become a beginning for honesty and healing to repair the wounds of the past. I have a dream that could help us achieve “The Dream” of Martin Luther King Jr., and the dream of Beloved Community which Jesus himself came to inaugurate. My dream is to see Columbus Day replaced with a “Day of Remembrance and Repentance.” A day in which the whole story of our past will be told in a way that honors all that is honorable and reveals all that is not honorable, so that we can move forward to a new day of reconciliation, peace and prosperity for all. We will not forget Columbus, but we will be honest about his success and failures. We will not ignore the genocide and slave trade that followed 1492, nor will we ignore the present inequities that are directly linked to policies of the past. We will not be those who hate everything about our nation because we will be honest enough about the past to lovingly build a future that embraces us all within the arms of Beloved Community. The biggest barrier to such an annual event? It might be difficult to market; I mean who would go to a Remembrance and Repentance sale? … I’m sure capitalism will find a way. Might as well make it easier on the retailers. I really enjoyed reading this, thanks for sharing! I too wish we could move past the national fallacy that Columbus was a hero and recognize the truth of his actions. My only objection is if it became either a “Marinate in White Guilt” Day and/or a “Get Whitey!” Payback Day. I can very easily see it going sour with a combination of both. Because those just continue the tribal warfare. But were they the ORIGINAL People of this land. Both Clovis points and Kennebec Man seem to indicate there were predecessor Peoples of this land — Kennebec Man shows ethnic characteristics of the Ainu instead of the Siberian tribesmen which match the usual Original People of this land. As if today’s Native Americans were just the latest wave of migration that absorbed or displaced or genocided the previous waves they found settled in. Your concerns about payback are common, but I think lack warrant. If the goal is to tell the truth about all aspect about history we will then wrestle with the good and the bad of various individuals and time periods. We can stop trying to protect our own interest in order learn from history and adjust our trajectory so we are not cursed to re-live it’s mistakes.